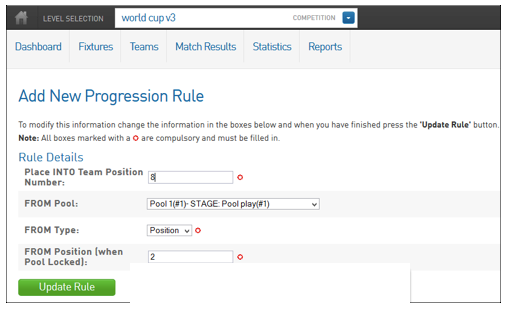 Progression rules for pools competitions can be created either during the initial set up of the competition or created at the end of each phase. Note: DO NOT run the progression rules until AFTER all rounds in each phase have been completed and the ladders are correct in each pool. 1. 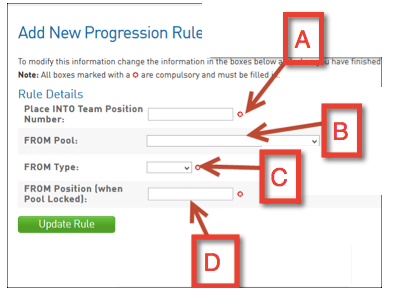 To set up the progression rules, select the add/edit button within the next phase. 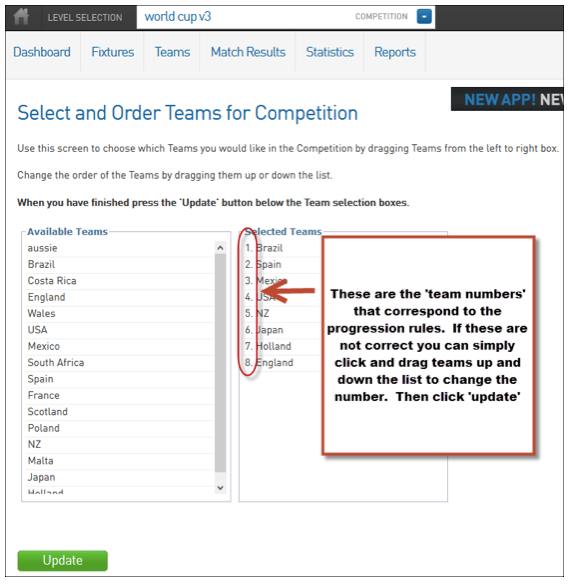 A- This relates to the number the team will be given in the finals fixture template or the fixture template that you are using for the new phase- refer to the competitions fixture/finals template to ensure they are positioned correctly. B- Select the appropriate pool that you want the team to move from. C- Based on the position in the ladder or total wins. D- The position the team you want to move are in, in their previous pool. a.) 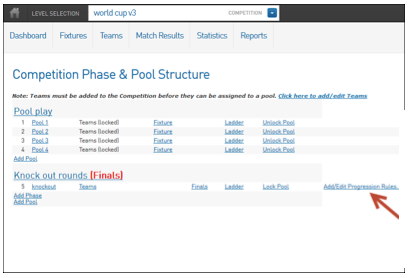 In this example I want the top two teams from each pool to progress through to knockout stages (finals) of the tournament. Here the team that finished in first place/position in pool 1 (on the ladder) will be placed into team position 1 in the final fixtures team list. Here the team that finished in Second place in pool 1 will be placed into team position 8 in the final fixtures team list. b.) This screen shows a summary of the progression rules. In a finals fixture template where 1v2, 3v4, 5v6 & 7v8. The team that finished first in pool 1 (team number 1) will play the team that finished 2nd in pool 3 (team number 2) based on the template that number 1 plays number 2. 3. 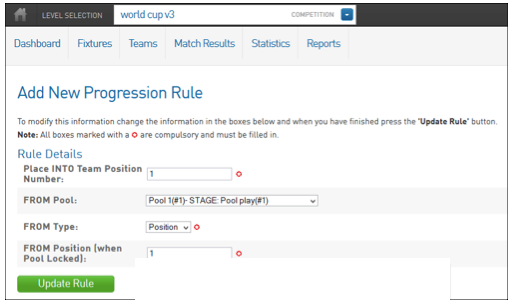 Once all games are finished, match results have been entered and the ladders are correct in each Phase 1/Initial Phase pool you need to lock the pools, to do this click on Look Pool. Ensure this is done for all the pools in this phase. 4. Click on the Look Pool button to confirm. 5. 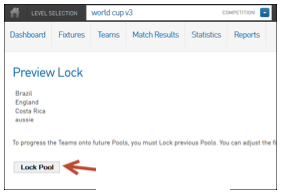 Click on Fixtures to return to the fixtures page to lock your remain pools. 6. 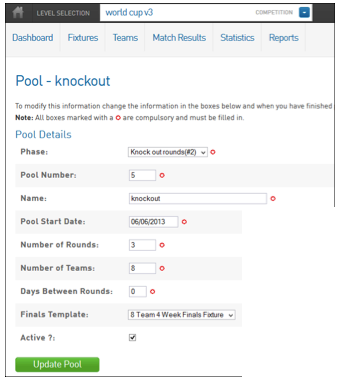 Before moving teams from Phase 1 to Phase 2 or Finals you need to configure the pools in the next phase, to do this click knockout. 7. Fill out the details marked with a red asterisk. If you are progressing to finals ensure that you select a finals template from the drop down list. 8. Then click Update Pool. 9. 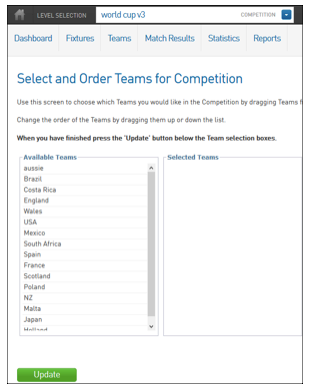 Before you can run the progression rules there can be no teams in the ‘selected team’ list for that stage of the competition. The progression rules will not work if you do this. (The cause of teams already being in the ‘selected teams’ list would be manual entry by an administrator). 10. You should now be able to run the progression rules. Once you do this teams will be moved from pool play (phase 1) to the next phase in the competition. 11. Rules have been run and teams should now appear in the ‘team’ area of the next phase. Click on teams and check if teams have progressed into that new phase. 12. Click on Regenerate Competition Finals Fixtures to generate your finals fixtures. 13. Finals fixtures will be generated. Note: If they are not displaying correctly it is probably due to the progression rules not matching the fixture template. Please check the ‘teams’ page to see if the ‘selected teams’ have the correct numbers (see screenshot below).